Shot Success is the ratio of shots to goals. We can see that Aubameyang is far ahead here with ~32%. Glenn Murray isn’t far behind, along with Raheem Sterling and Anthony Martial. What we’re seeing here is Aubameyang and Murray being clinical with their shots. Whilst Sterling and Martial aren’t shooting as often, they’re scoring a good percentage of their shots. Richarlison missed a lot of shots last season which brings his overall down under 10%. Big Chance Conversion is a measure of how many ‘big chances’ (according to PL.com) each player has scored/missed. Here we can see that Aleksandar Mitrovic has been the most reliable over the last two PL seasons with 70% of his Big Chances scored. Murray has scored all of his Big Chances this season, and is only slightly behind. 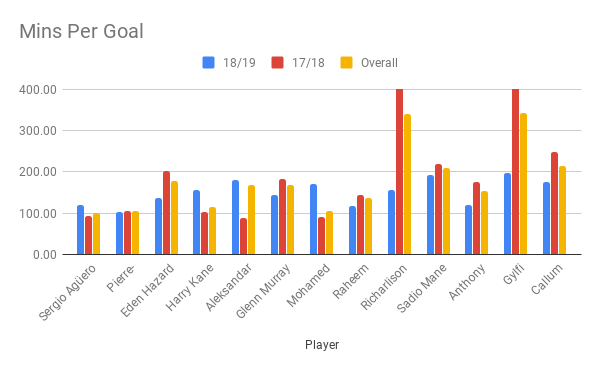 Kane and Salah have missed a lot more Big Chances this season, which could account for their lack of goals so far. Goals per minute can be a good method of measuring a forwards goal return. Richarlison and Sigurdsson are actually off the scale at over 500 mins per goal last season. The best in terms of GPM are Aguero, Aubameyang, Harry Kane and Mo Salah, all averaging one goal every 100 or so minutes. 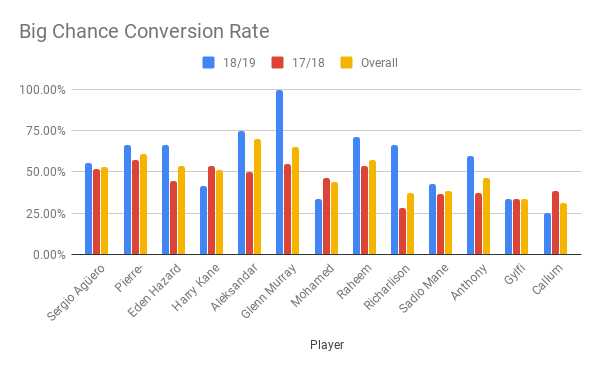 It is interesting to see Eden Hazard doing much better this season under Sarri, showing he really is getting forward more. Next I looked at the best shot to goal ratio inside the penalty area. As you’d expect Aubameyang came out on top again, followed by Murray and Sterling. It’s interesting to see Sterling this high up, it really shows he is getting into the box more and creating chances for himself. Martial has started brilliant this season in this regard, but looking at his return last season it isn’t likely to last. Finally I looked at each player’s team contribution and how important they were to their respective clubs. As you’d imagine, the stats suggest that Harry Kane and Glenn Murray are the most important players for their clubs, scoring over 35% of their goals over the past 2 seasons. Mo Salah is also very influential at Liverpool. However, this is a very crude estimation, which only takes into account this seasons form. For instance, I would be very surprised to see Martial on 24 goals and Murray on 22 at the end of the season, compared with Salah’s 20. To achieve a more realistic result, I combined data from this season and last. This was starting to look a bit more realistic. Next I looked at big chances. 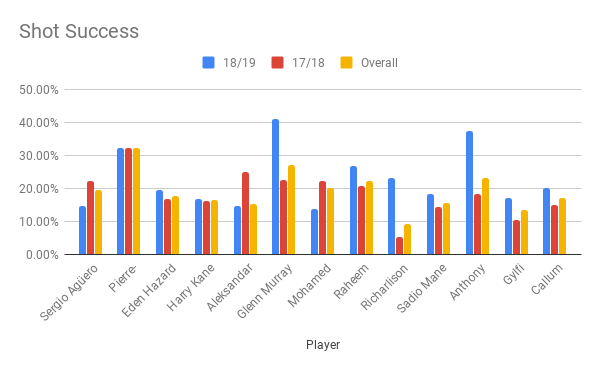 Players like Kane and Salah had missed a lot more big chances this season than last. I reasoned that this should balance out over the course of the season, so I took their average Big Chance Conversion rate over the last two seasons and applied it to the remaining games. This produced this result. 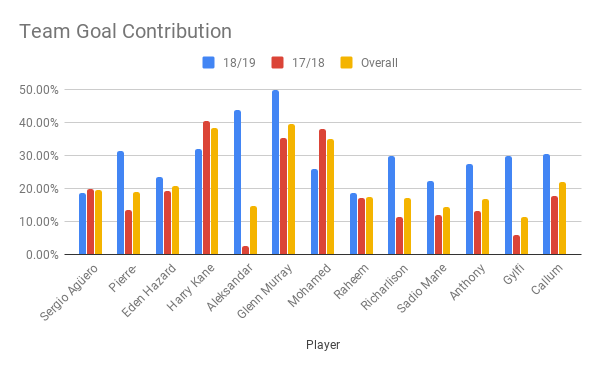 You can see that this drastically improved Salah and Kane’s figures, whilst reducing Aubameyang and Sterling’s. This is due to the fact that this is influenced much more by last season’s numbers. 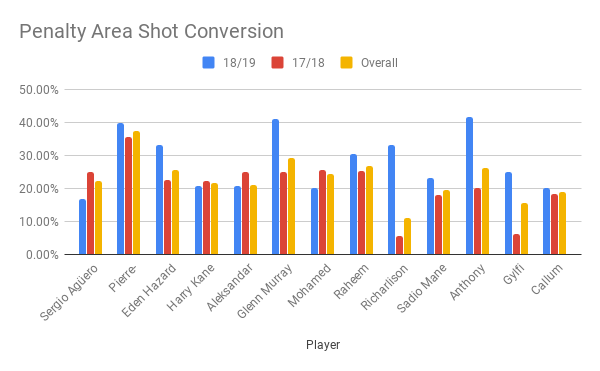 Finally I looked at the number of shots each player had in the box and their chance of converting, again for the last two seasons. Then modelled a prediction on the remainder of the season. Again it was Aubameyang on top, followed closely by Aguero. 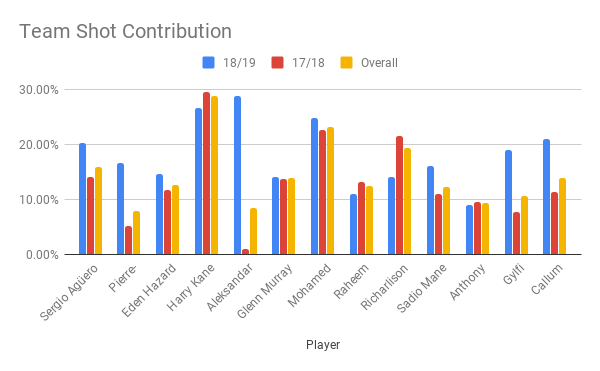 Kane and Salah just don’t seem to be scoring as many chances as they did last season, whilst Aguero and Aubameyang have picked up where they left off last year. To conclude, I calculated some averages to produce a final table of what I predict the top goalscorer table will look like at the end of the season. So, there you have it. According to the stats, Pierre-Emerick Aubameyang will be top scorer at the end of the season. I must stress this is not based on the fixture list nor does it take into account injuries or European fixtures that might mean players are rested. But the statistics are solid (as of Gameweek 14), and it’ll be interesting to see if it’s close come the end of the season. If you were interested in this post and want to see more statistical pieces like this, let us know. I was thinking of writing a piece about other positions in the future, and possibly looking into any questions you have. All stats were taken from WhoScored and The Premier League.